ISM Finland is an international music school offering private and group music lessons to students of all ages and abilities. As one of the few music schools in Finland that follows the internationally recognized ABRSM syllabus, our music exams follow the same standard as those in 92 other countries! You can read more about ABRSM here. 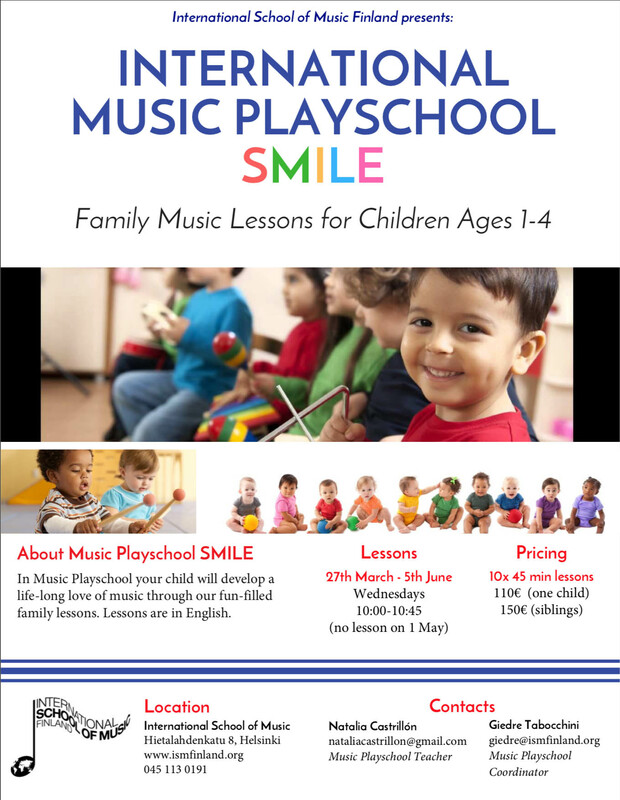 In addition to private and group instrumental tuition, ISM Finland also has an extensive early childhood music education program. We don’t have entrance examinations because we believe that music is for everyone: all ages and abilities! We believe that life is about personal growth and development and that joy is the key for learning. Find the right teacher and sign up for music lessons today! If you are interested in hearing more, you can learn more about our music lessons here. ISM is a registered non-profit organisation with a Teaching License (Opetuslupa) and funding from the city of Helsinki. Two New Playschools starting March 27! 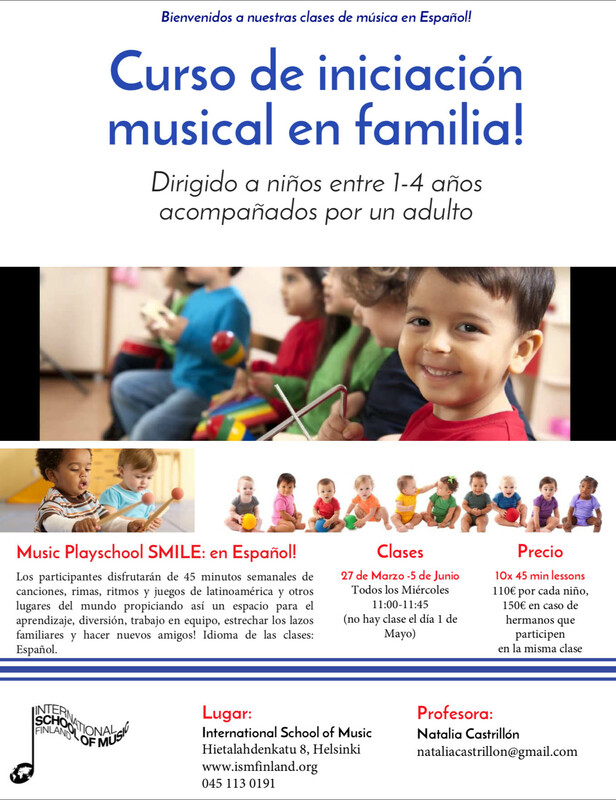 We have two playschools beginning on March 27th: an English-language class from 10:00-10:45 and a Spanish-language class form 11:00-11:45. Please contact Giedre for more information. 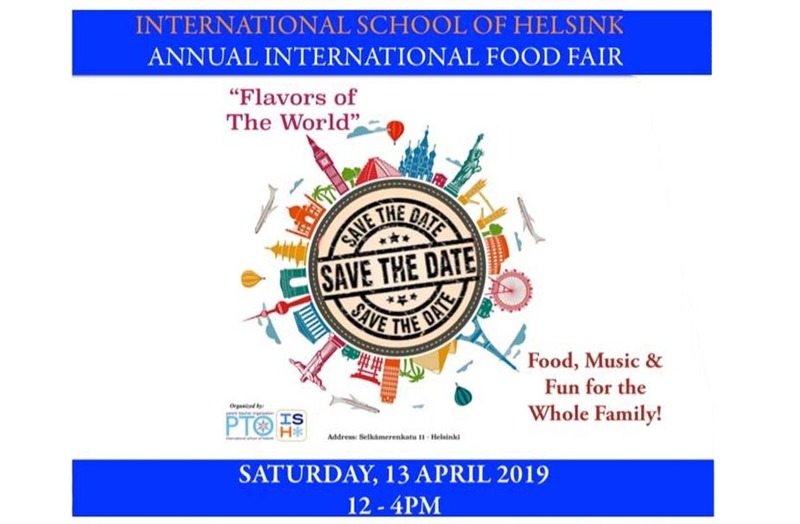 ISM Finland will be at the 2019 International School of Helsinki International Food Fair. The event will offer homemade foods from all over the world, music and cultural performances, activities for children of all ages and a raffle with fantastic prizes. ISM Finland will offer the opportunity to try out instruments at the fair and provide prizes for the raffle! 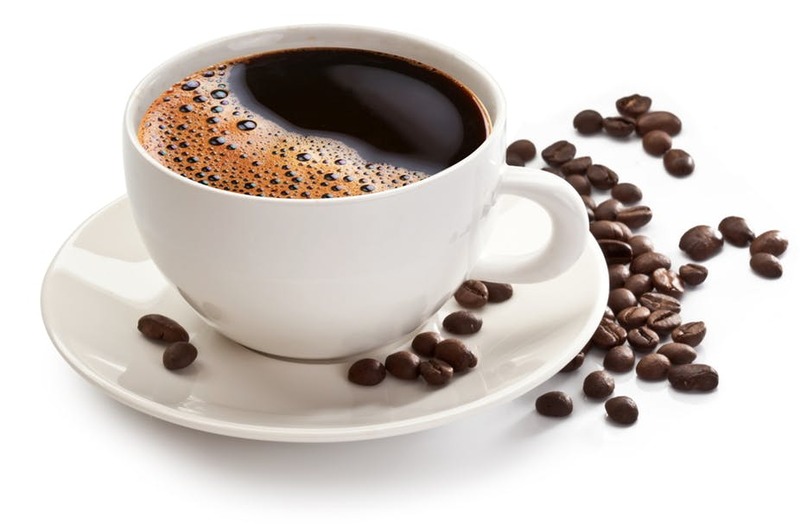 We would love to invite all of our students’ parents for morning coffee at our studio. It will be a great opportunity for you to ask any questions you may and to meet in person. We would also be happy to hear any feedback you may have, as well as any suggestions for the coming year! ISM Finland is the Finnish liaison for the Associated Board of the Royal Schools of Music (ABRSM), which provides internationally accredited exams to music students at various levels. ABRSM exams are provided in 93 countries and are often viewed favourably by applications boards at music conservatories and universities. ISM organises student concerts at partner schools as well as regular workshops & masterclasses in cooperation with multicultural communities including the Global Music Centre and International Culture Center Caisa.